Blackpool fought back from two goals down to draw at home to the struggling Barrow club. Holker are second-bottom of first division north but had won at Atherton in their last game. First Tyler Wood headed home a poorly-defended corner on seven minutes, then player-manager Kevin Watkin lofted the ball over stranded keeper Alex Cameron after a quick break. 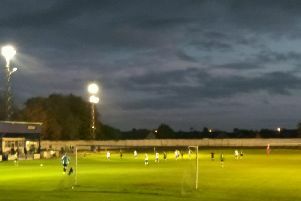 Three minutes later Ben Fishwick halved the deficit as his unstoppable freekick from 20 yards found the top corner, leaving Sam Stephens in the Holker goal rooted to the spot. The away side probably had the upper hand for the rest of the first half, which produced no further goals. AFC were much- improved in the second half but it took another set-piece, this time a superb curled effort by Elliot Dickson, to draw them level on the hour. Both teams looked for a winner and had penalty claims turned down, while Conah Bishop shot just wide for AFC, who are 12th.